Personal Note: I found this to be a very interesting article and would recommend reading it. Professor Demetriades states at the end of his introduction "We probably know a great deal more about the life of the ancient Greeks in the age of Pericles than about how our own grandfathers lived two or three generations ago. " - How true! His article helps clarify some of this for us. A lot is written about the history of Thessaloniki and its monuments, and there is much yet to be written about the city, which has already enjoyed a continuous life of 2,300 years, presenting many different forms of building, politics, culture, and society under many masters. It has much to offer the scholars who study it. Even today, there remains a considerable number of historical issues requiring further research. The information presented here is drawn largely from primary sources that I have had in hand for nearly three decades, while I served as Director of the Historical Archives of Macedonia in Thessaloniki. The most important of these sources were the approximately 350 records of the Ottoman Judges (kadis), dating from ca. 1690 to 1912, consisting of thousands of documents of varied content. Land, taxation and vakif (pious endowments) regirters (registries) also provide abundant valuable information. 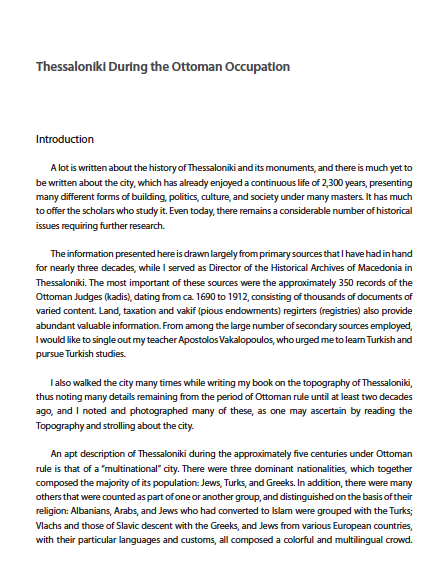 From among the large number of secondary sources employed, I would like to single out my teacher Apostolos Vakalopoulos, who urged me to learn Turkish and pursue Turkish studies. I also walked the city many times while writing my book on the topography of Thessaloniki, thus noting many details remaining from the period of Ottoman rule until at least two decades ago, and I noted and photographed many of these, as one may ascertain by reading the Topography and strolling about the city. An apt description of Thessaloniki during the approximately five centuries under Ottoman rule is that of a "multinational" city. There were three dominant nationalities, which together composed the majority of its population: Jews, Turks, and Greeks. In addition, there were many others that were counted as part of one or another group, and distinguished on the basis of their religion: Albanians, Arabs, and Jews who had converted to Islam were grouped with the Turks; Vlachs and those of Slavic descent with the Greeks, and Jews from various European countries, with their particular languages and customs, all composed a colorful and multilingual crowd. Together with these groups coexisted a small number of Europeans - from France, England, Italy, and Malta - who exerted a significant economic influence on the life of the city. It would be interesting to take a closer look at how all these different nationalities lived and functioned within the city walls. We probably know a great deal more about the life of the ancient Greeks in the age of Pericles than about how our own grandfathers lived two or three generations ago. It is a rather common misconception that the Ottoman occupation was an era without changes from beginning to end, and people extrapolate the way of life from its final years, which are the best known, back to the 15th century. The rate of change was certainly much slower that what it is today, but it would be incorrect to believe that nothing changed for 500 years.